Shug’s Daughter Confirms Father’s Affinity For Houndstooth—Brooks Brothers Houndstooth! BEAR WHO? 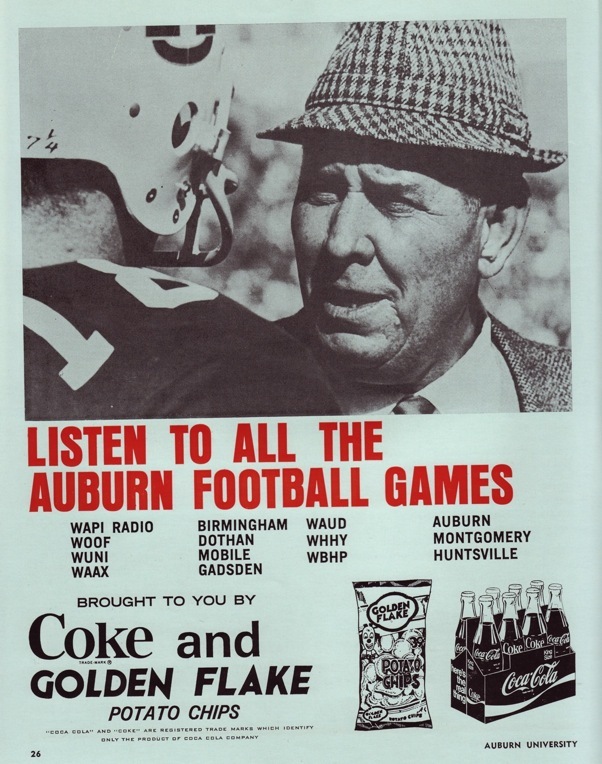 Yet another example of Shug in houndstooth, this from an ad in the 1970 Auburn vs. Georgia "Auburn Football Illustrated." Bear with us, as it were, while we unravel the irony. Last Tuesday, The War Eagle Reader posted news that Brooks Brothers’ had finally released its new Auburn collection—and that it included a “houndstooth” Auburn tie. Auburn fans vomited all over the internet. The day after that, The War Eagle Reader attempted to capitalize on Tie-Gate by posting a rare photo of Shug Jordan in a houndstooth-ish hat. Careful what you’re right about. Turns out that Shug’s daughter, Susan Pilgreen, reads The War Eagle Reader. (Of course.) It also turns out that Auburn fans might owe Brooks Brothers a historically unexpected apology. Yes, you read correctly. According to Shug’s own daughter, the houndstooth-ish hat in question… was made by Brooks Brothers. Susan’s revelation is further confirmation that, if a picture is worth a thousands words, photos of Shug in Brooks Brothers houndstooth needn’t be read as canon-threatening gnostic gospels. Everything is permissible, the Apostle Paul tells us—even, apparently, houndstooth-patterned accessories of legendary American quality. This photo is from 1970 and I have always understood Bryant started wearing the black and white houndstooth after it was given to him by the head of the AFL for steering Joe Namath there rather than the NFL, which was in 1965. I would be interested to see a color photo of Shug’s houndstooth hat (that is kind of hard to say). I somehow doubt it is a black and white pattern and that the state’s two biggest coaches were wearing matching hats. During the years that Shug wore that hat it was NOT recognized as being a bammer “thing”. It was, at that time, just a classic design. There are a lot of pictures of the bear in a black and white plaid hat. Bama thinks it owns hounds tooth, but it doesn’t. Some enterprising AU fan should produce some items with navy/burnt orange versions of hounds tooth–hats, scarves, etc. I would certainly would buy one! @Ephemeral I have seen orange and blue houndstooth ball caps. As well as houndstooth with AU on it just to make Bammers mad. It is my understanding, that while Bryant did receive as a gift from the Jets owner (may have also been the head of the AFL) as a gift, he didn’t immediately wear it. I’ve read accounts where it was only worn a few times, late in his career, at the urging of his daughter who found it/noticed it one day.